Imagine a hot summer day in the middle of the desert. That temperature might be dangerously hot here on Earth, but it's almost impossibly cold for any star. But that's the rather pathetic situation for a newly discovered brown dwarf. The brown dwarf, designated WD 0806-661 B, is the coldest star-like object we've ever been able to directly image. There's a rather nice artist's impression of the brown dwarf and its stellar companion, a white dwarf star that itself is the remnants of a collapsed sun. Located about 63 light-years from Earth, the brown dwarf has a temperature somewhere between 80 and 160 degrees Fahrenheit. That means there's about a 25% chance that this thing is actually colder than the human body temperature. 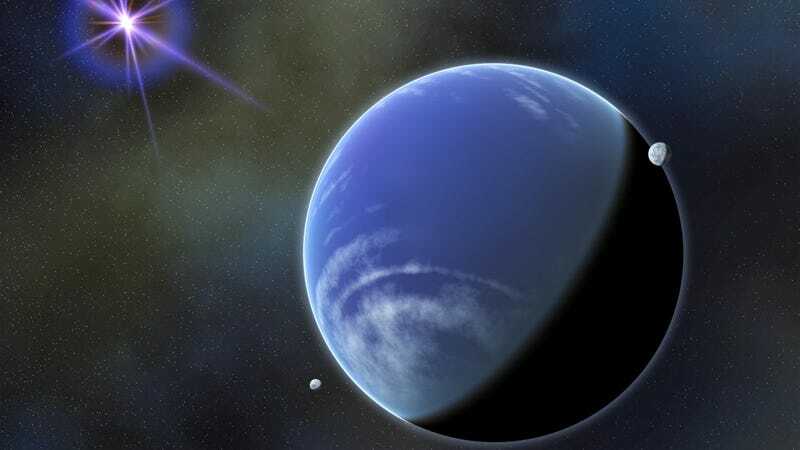 "This planet-like companion is the coldest object ever directly photographed outside our solar system. Its mass is about the same as many of the known extra-solar planets — about six to nine times the mass of Jupiter — but in other ways it is more like a star. Essentially, what we have found is a very small star with an atmospheric temperature about cool as the Earth's. "The distance of this white dwarf from its brown-dwarf companion is 2500 astronomical units (AU) — about 2500 times the distance between the Earth and the Sun, so its orbit is very large as compared with the orbits of planets, which form within a disk of dust swirling close around a newborn star. The two companions likely formed as a binary star system billions of years ago. The white dwarf has since lived an entire stellar lifetime, run out of fuel, and collapsed into its present, desiccated state. The brown dwarf, on the other hand, never even got that far, instead eking out billions of years as this cold, tiny husk. Basically, I'm guessing these two aren't the life of the intergalactic party. "Brown dwarfs that are far from their companion stars are much easier to study than are planets, which typically are difficult to observe because they get lost in the glare of the stars they orbit. Brown dwarfs with Earth-like temperatures allow us to refine theories about the atmospheres of objects outside our solar system that have comparatively cool atmospheres like that of our own planet." Via Penn State. Artist's impression by NASA Goddard Space Flight Center/Francis Reddy.